strange post-modern mime to top off a carboniferous day! Friday was, of course, the opening ceremonies of the Olympics. 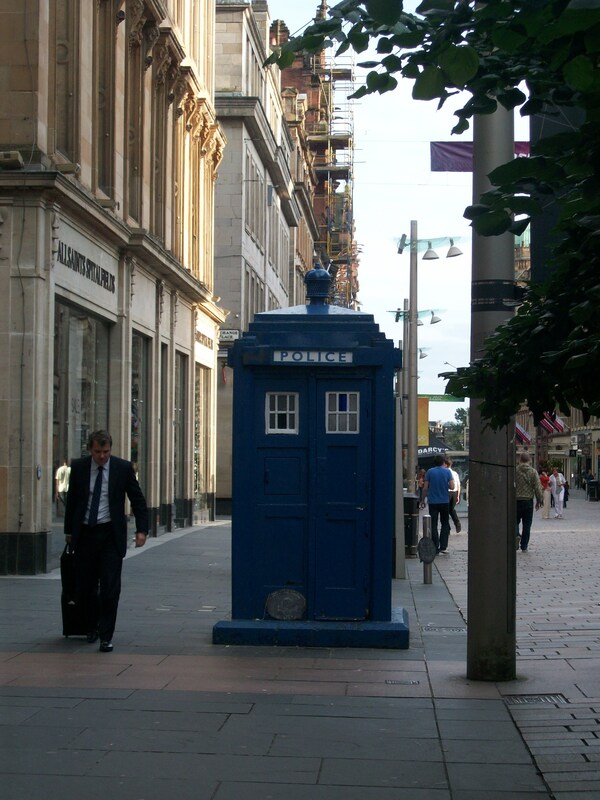 It’s also the Merchant City Festival in Glasgow, so we saw some pretty interesting things today! But first we headed over to the Kelvingrove Museum…it’s an eclectic collection that had something interesting for each of us. 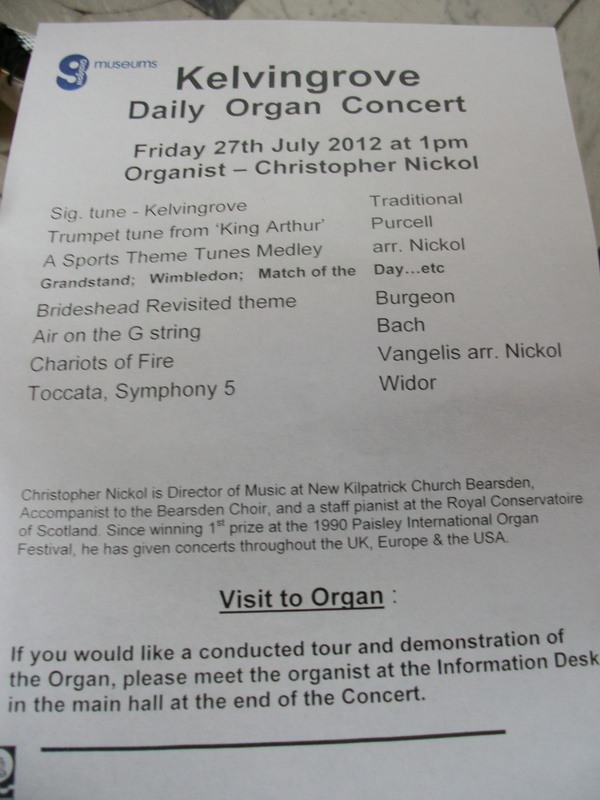 And there’s an organ recital each day on the 100 year old organ in the great hall. 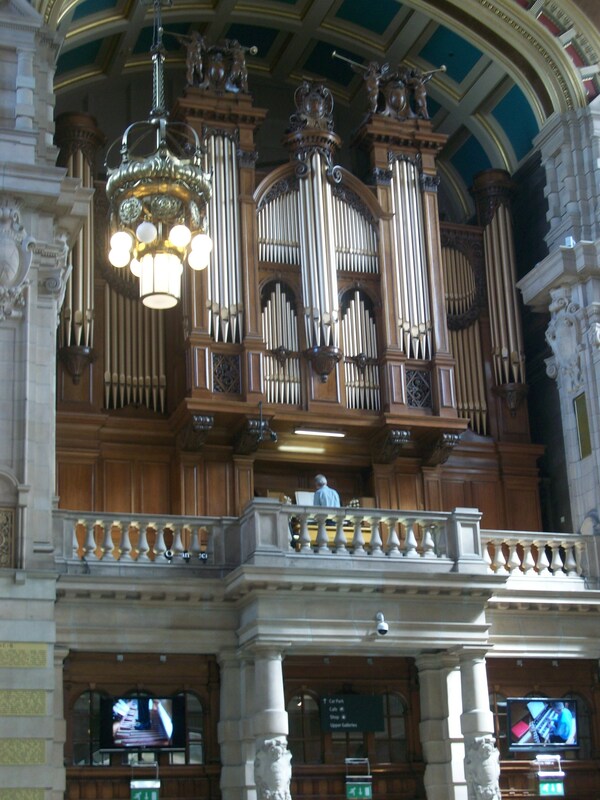 The recital begins with the tune inspired by the place–Kelvingrove–which many of you might know better as the tune for “Will You Come And Follow Me.” The organ has not been “upgraded” to an electric system, it’s still as it was originally built (including the pre-sets for the stops, built in in 1900! ), which is awesome. It’s quite the instrument. After the great 30 minute recital (which today was Olympic-themed, complete with Chariots of Fire! ), the organist led a tour of the instrument, including showing how the organ works and a chance to see the pipes and blowers behind the beautiful case! One of the coolest things about the recital was the screens that showed the organist’s feet and hands, so you could watch him play. Awesome. On the way back we found ourselves in George Square, outside the hotel, watching The Big Man Walking. 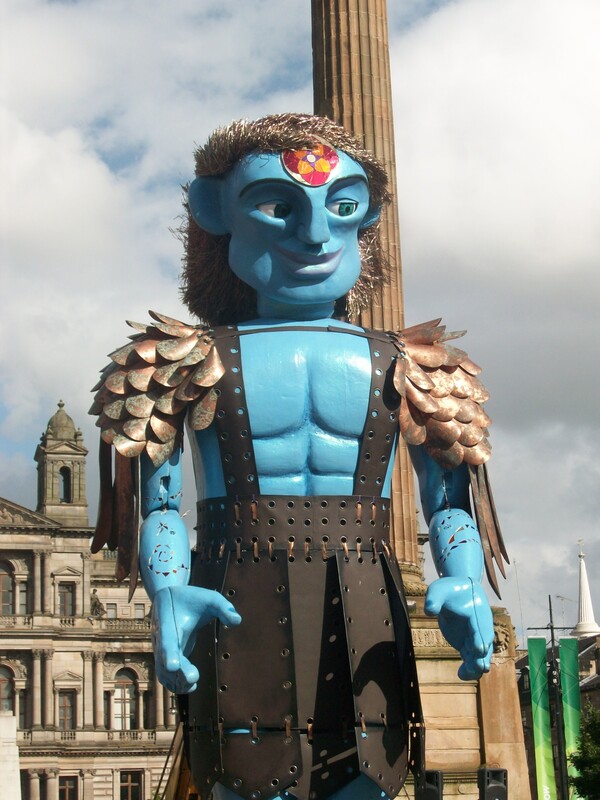 It’s an enormous blue puppet. It’s quite bizarre, and the people around were strangely miming different actions and conversation with the puppet. Apparently later the Big Man actually “walked” through the city to another location. Strange. We missed that because we went to dinner, which was also delicious! Tomorrow morning we head to Iona. We won’t have regular internet access there, so you’ll have to wait for blog posts until we get home. Until then, enjoy your week! organist playing at Kelvingrove–and on the screens at the bottom you can see his feet (on the left) and hands (on the right). 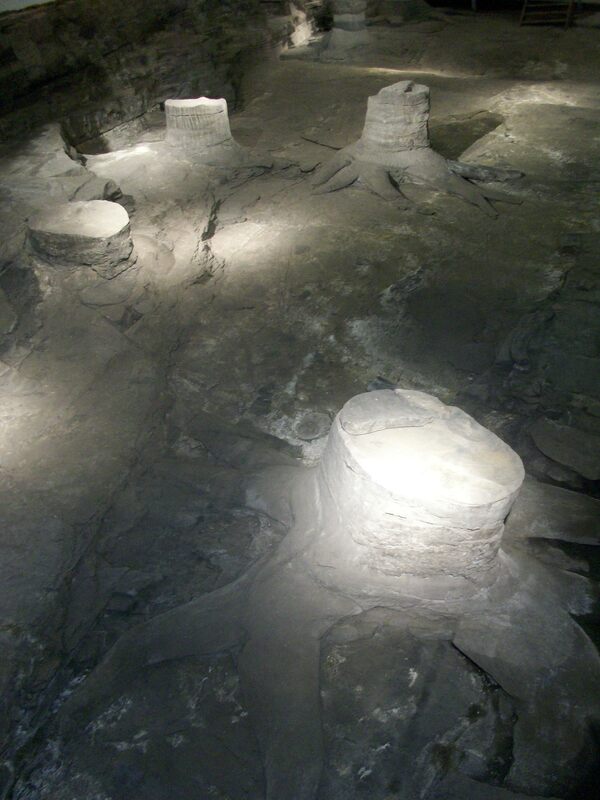 fossils of scale trees, a distant (and extremely large) relative of clubmoss, in-situ where they were found. So…before we came, everyone was worried about the food. The stereotype of british food is bland and overcooked, tasteless, mediocre, and heavy on the carbs and weird stuff like mint peas and haggis. Add in that the trip leader is a vegetarian, and you have a recipe for food being near the top of the list of concerns nearly everyone had before arriving! Well, never fear–because when you travel with Teri, there will always be good food. Our food experience has been a pleasant surprise to everyone (sometimes even to the fearless planner! 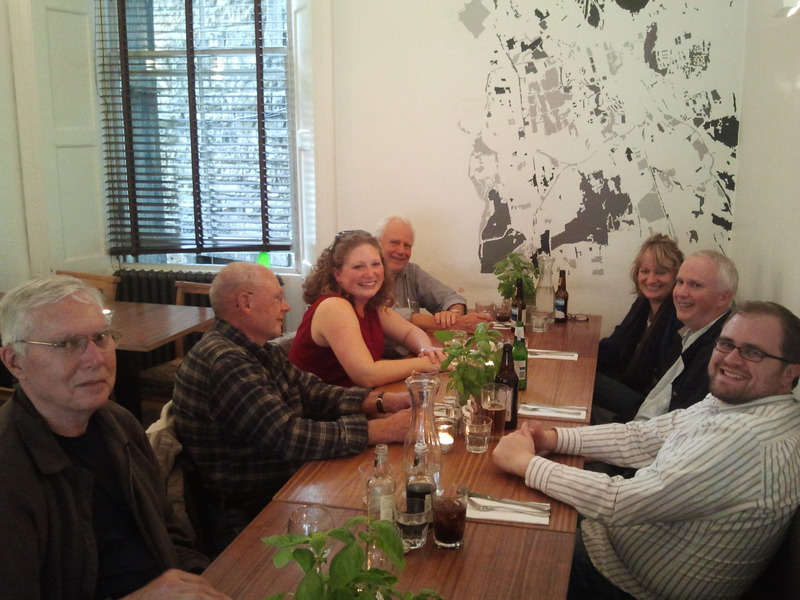 ), in part because every single restaurant on the itinerary was a recommendation from one of Teri or John’s friends. We’ve focused on either local classics or places that use local produce, and several of our restaurants have been part of the slow-food movement. Everything’s fresh made and most of it is full of delicious things like Scottish cheese or beef, locally grown greens and tomatoes, and fabulous homemade breads and soups. We’ve enjoyed ourselves at the Elephant House (for the ambience, not the food–it’s a place many writers have been known to work on their latest projects, including JK Rowling), at an Indian restaurant run by a mosque (for some of us, it was our first experience of Indian food! ), at a Scottish comfort food restaurant (sausage and mash! fish and chips! steak and ale pie! ), at neighborhood restaurants a bit off the beaten tourist-path, a local fish-and-chip favorite, and even a vegetarian restaurant (where we joined the clean plate club, and even Steve was saying it was his favorite meal of the week!). We’ve experienced some new things–deep fried haggis bites, curried parsnip soup, steak-and-kidney sausage, nut-loaf (instead of meatloaf). We’ve enjoyed the Scottish twist on old favorites–12 flavors of mashed potatoes, mac-n-cheese made with local cheddar and onions, Scottish beef burgers with brie and pineapple. And we’ve discovered the reality behind the traditional full cooked Scottish breakfast–1600 calories. Of course, no trip is complete without some incredible sweets….whether it comes in the form of brownies with both chocolate sauce and ice cream, or belgian waffles smothered in nutella, or the traditional cranachan, or one of the oldest ice cream shops we’ve been in (in the same location over 100 years! ), there’s always something for the sweet tooth too. the clean plate club–at the VEGETARIAN restaurant! 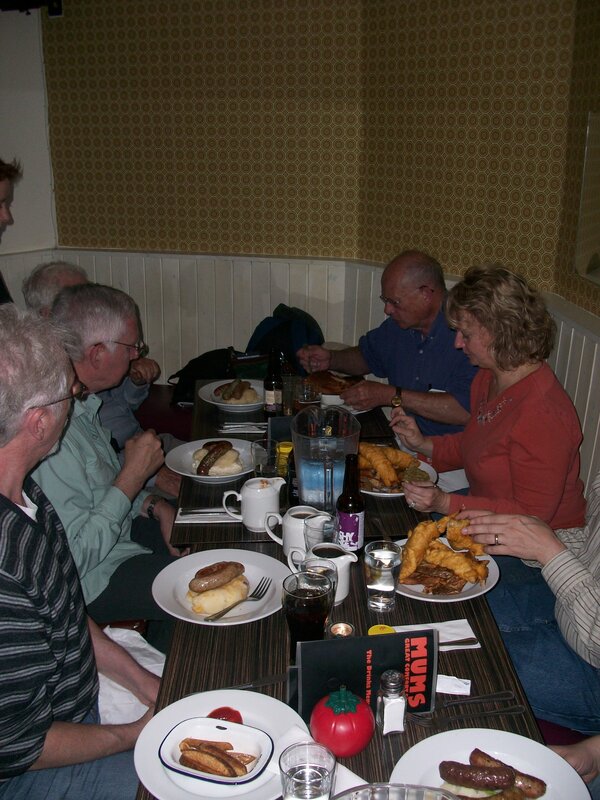 scottish comfort food–sausages and mash, fish and chips…they can’t even look away from the food long enough for a picture, it’s so delicious. 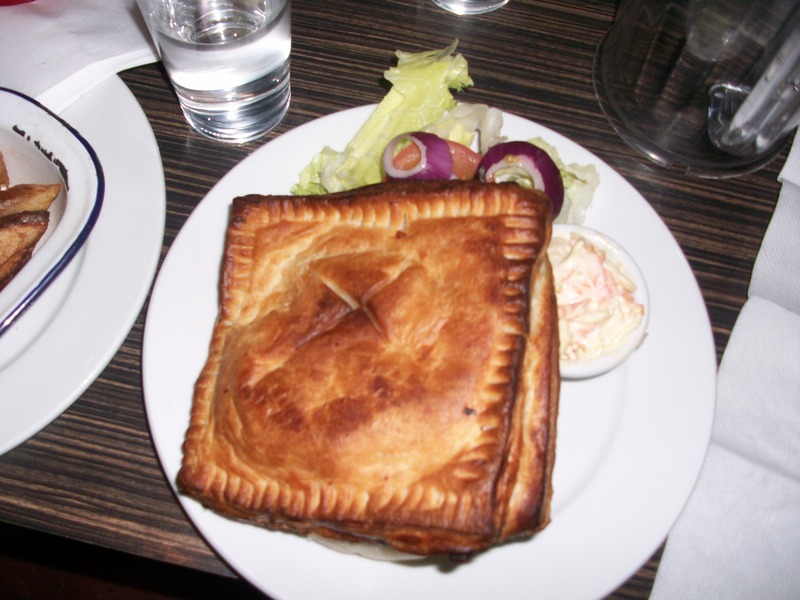 what does a vegetarian eat at a scottish comfort food restaurant? a cheesy mushroom wellington in delicious flaky pastry, on top of mushroom-and-garlic mashed potatoes. oh yeah. having so much fun, I forgot to blog! Apologies for not getting a blog post up the last couple of days–our fun has extended into the evening and I’ve fallen asleep without getting the blog written and pictures uploaded! So, let’s see…where did we leave off? 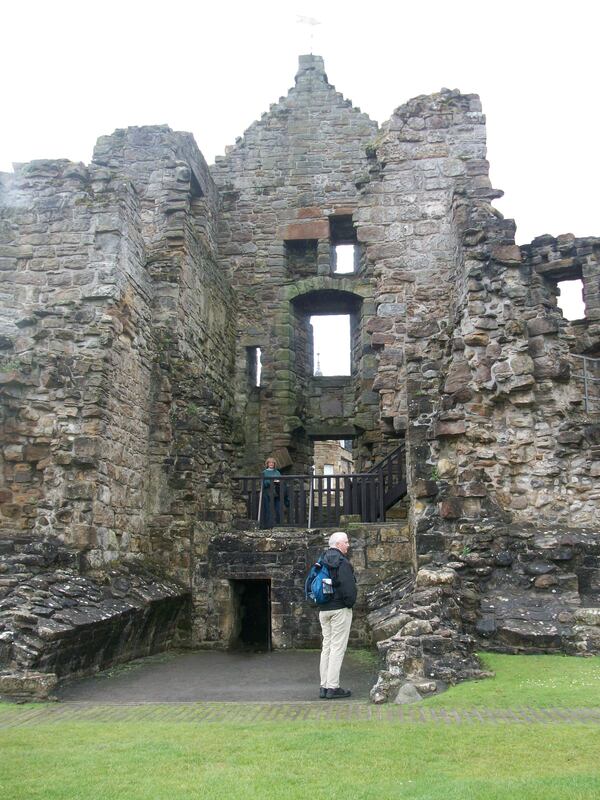 Monday we visited Saint Andrews, with its beautiful picturesque ruins of castle and cathedral. 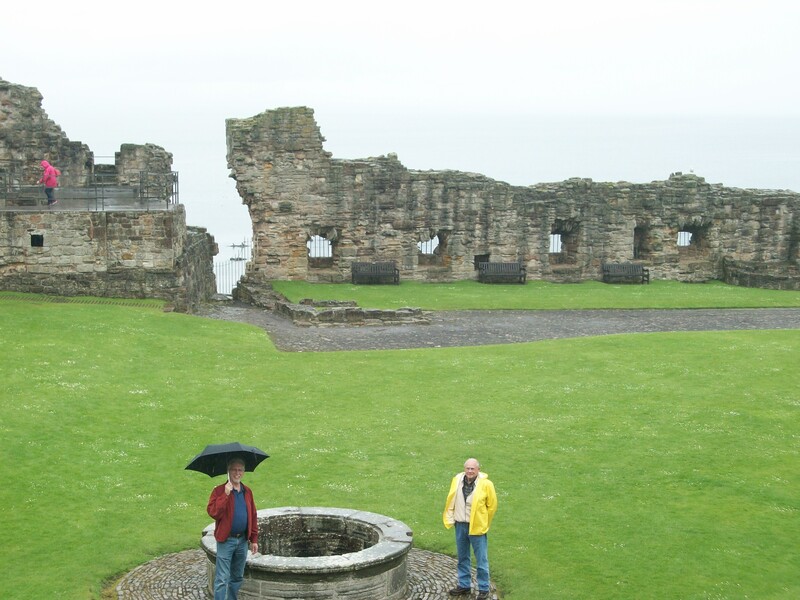 Of course it was drizzling too, so it was quite the right atmosphere for wandering medieval ruins! Saint Andrews is important for many reasons–among them, it was the site of John Knox’s original joining up with the beginnings of the early scottish protestant movement (and George Wishart, who was burned at the stake here), and where he was captured from the siege of the castle and taken away to be a galley slave for some time. 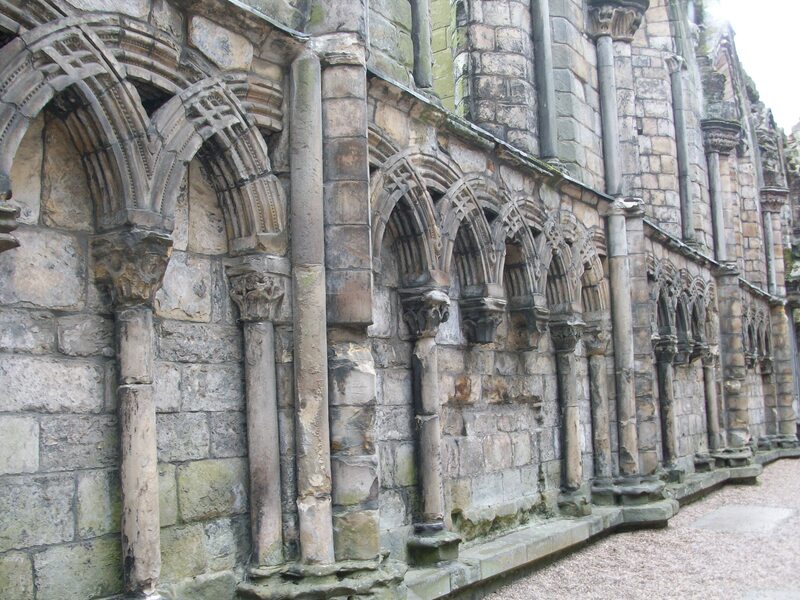 It’s also the site of the high kirk of Scotland, the cathedral, for many years–some call it the seat of the Scottish church. 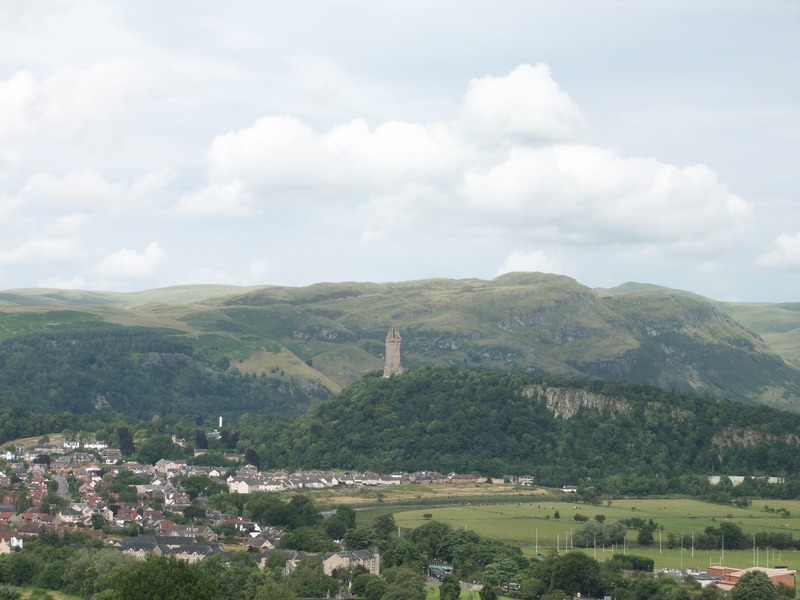 Tuesday we visited Stirling, including climbing up the 246 stairs of the William Wallace Monument, which is already on top of a steep hill, so it was a workout–all before lunch! 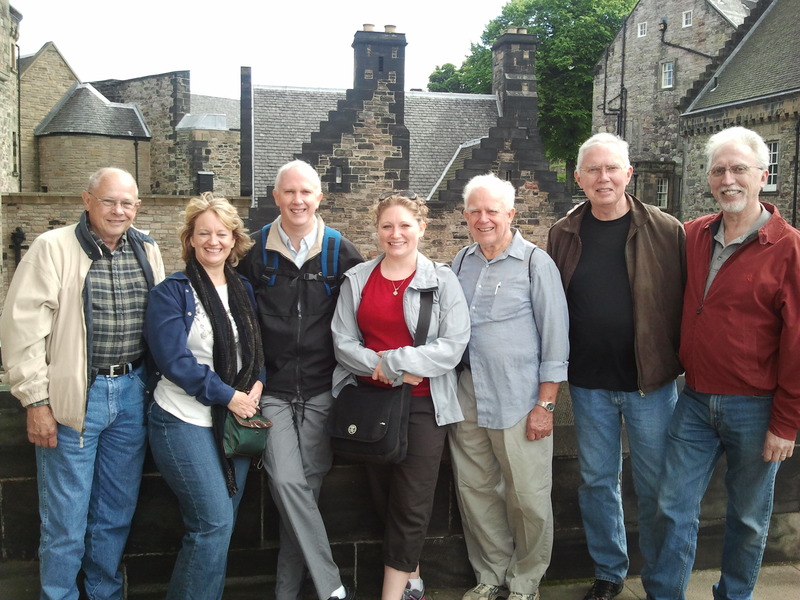 We learned a bunch about the Scottish Wars of Independence (in the 12-1300s). After lunch (soup and sandwiches for most of us…or two kinds of soup, no sandwich, for Teri! You all knew I was indecisive, right? 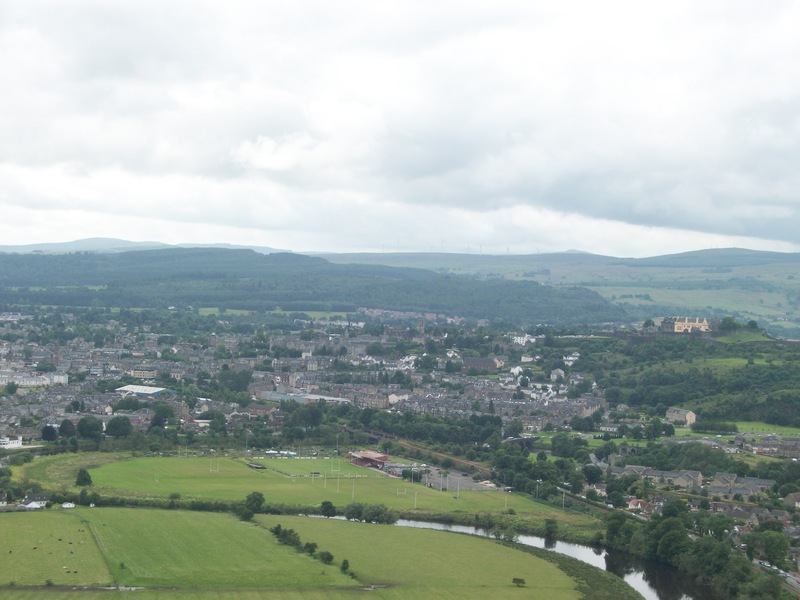 heehee) we walked up yet another steep steep hill toward Stirling Castle. They aren’t kidding when they say it’s the most defensible fortress around. On the way up we stopped at the Church of the Holy Rude, which is so far everyone’s favorite church building. Not only does it still have its original medieval timber roof, and not only was the organist practicing while we were there (which definitely adds to the atmosphere), and not only is there a ton of information AND volunteer church members to ask questions of, but it’s also the only standing church in Scotland that has been the site of a coronation. 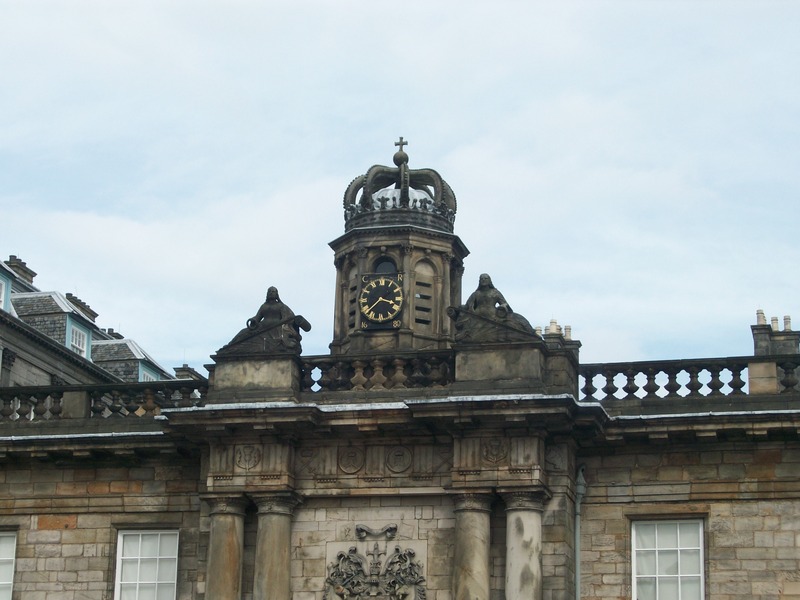 That’s right–James VI of Scotland (later also James I of England), son of Mary Queen of Scots, was crowned king of Scotland in this very church when he was 13 months old. 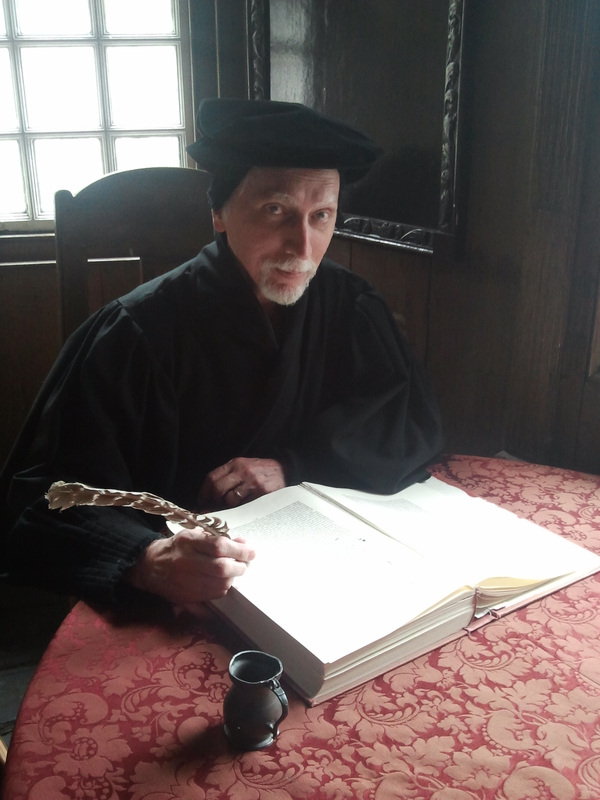 It was the first Protestant coronation ceremony, and the preacher was none other than John Knox! It was quite a place. 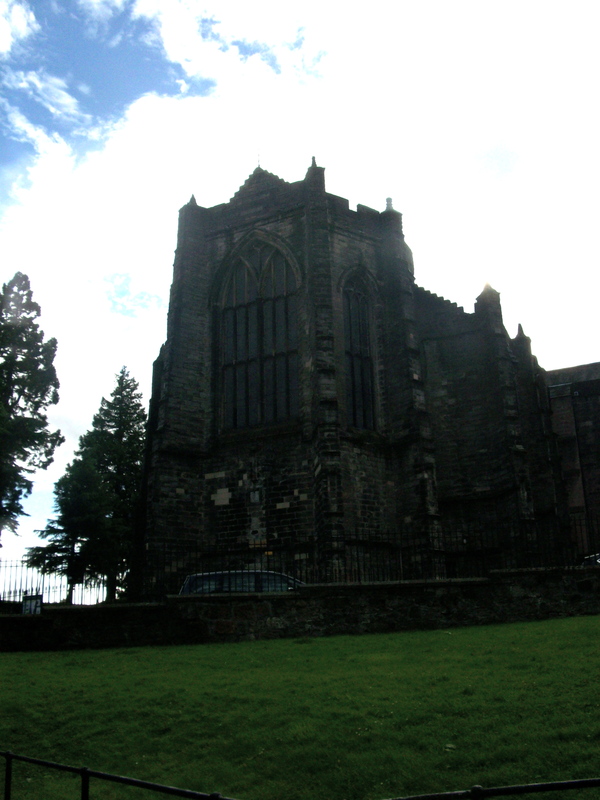 When we’d poked around the church a bit, it was off to the castle. We didn’t have anywhere near as much time as we’d hoped (we spent a long time at the Wallace Monument in the morning and early afternoon), but we still caught a guided tour and had some time to run around enjoying the view and the beautifully restored parts of the castle–so you can see what it would have looked like during the time of the Stewart Kings/Queens who so loved the place. You can see why–it’s awesome. 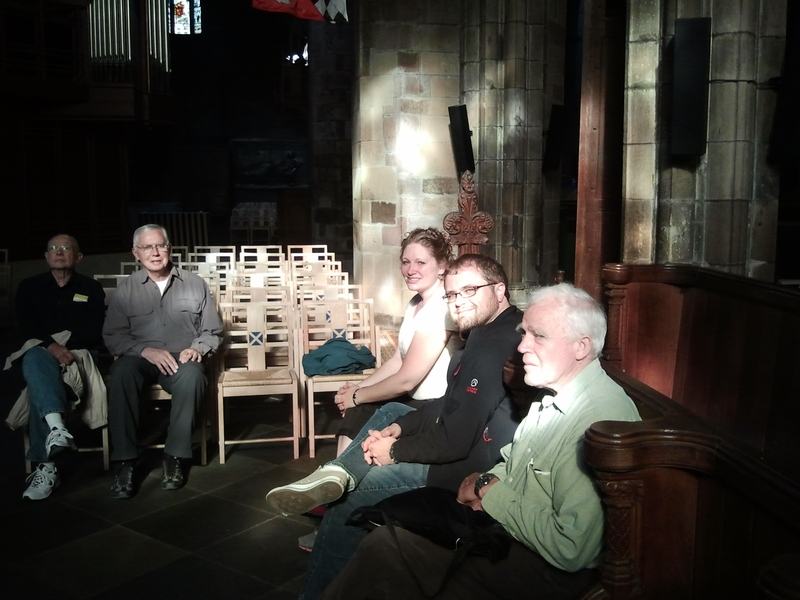 Wednesday morning we went to an early morning communion service at St. Giles Cathedral, then spent some time chatting with the Associate Pastor there. She told us more about the church building, about its history, and some about the congregation today. 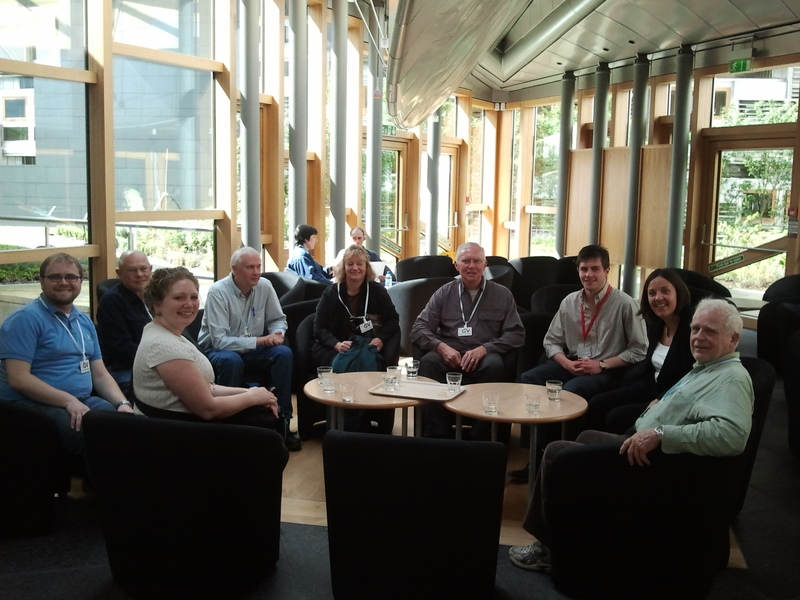 After a cup of tea, we walked down the Royal Mile to the Scottish Parliament, where we met with Kez Dugdale, a member of the Parliament for the Labour Party. She and her assistant Greg spent–are you ready?–TWO HOURS talking with us and giving us a private tour of the Parliament building. It was awesome. 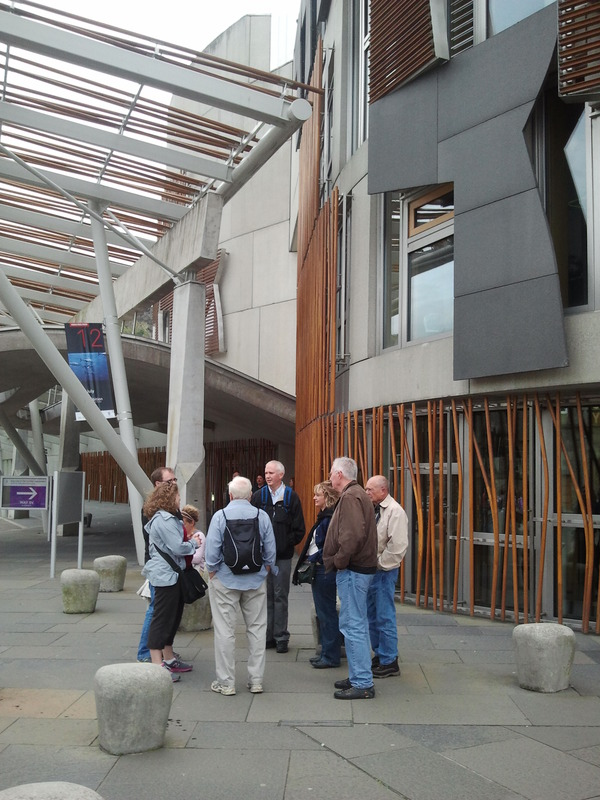 We learned so much about Scottish politics and society, about how the parliament works and what they can do, and all kinds of other things. 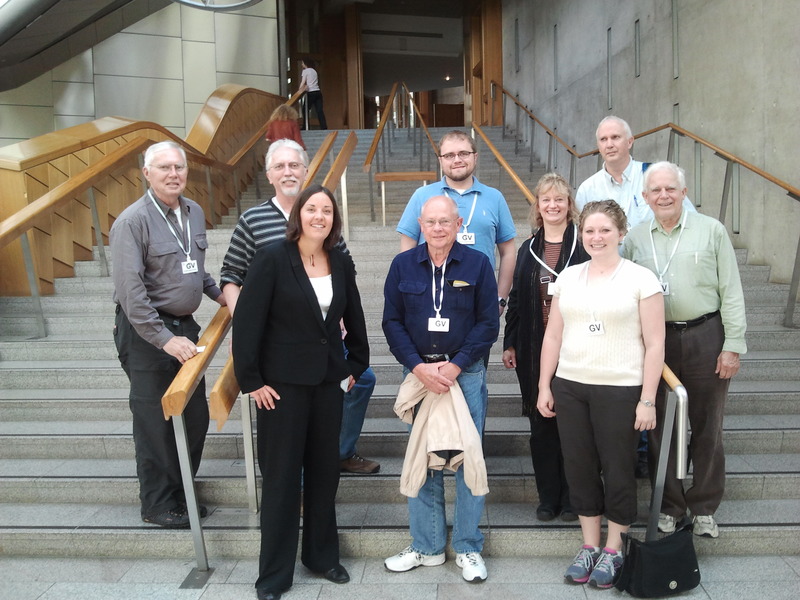 It was one of the highlights of our trip so far to chat with Kez and Greg, and we are super grateful to Teri/John’s friend Ewan Aitken (a member of the Iona Community!) for setting that up for us. 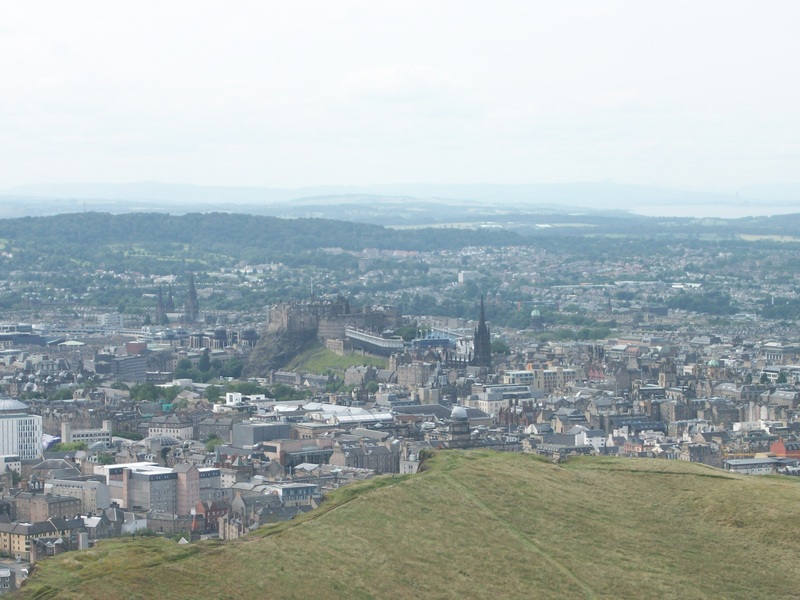 We took the opportunity for a free afternoon in Edinburgh–some wanted to visit the museum, others do some shopping, and a few of us even climbed Arthur’s Seat (the highest point in Edinburgh, an extinct volcano, with incredible views–especially on such a sunny day!). Teri even got a sunburn (which will surprise no one, of course). Then it was off to the train station to head to Glasgow for a couple of days. 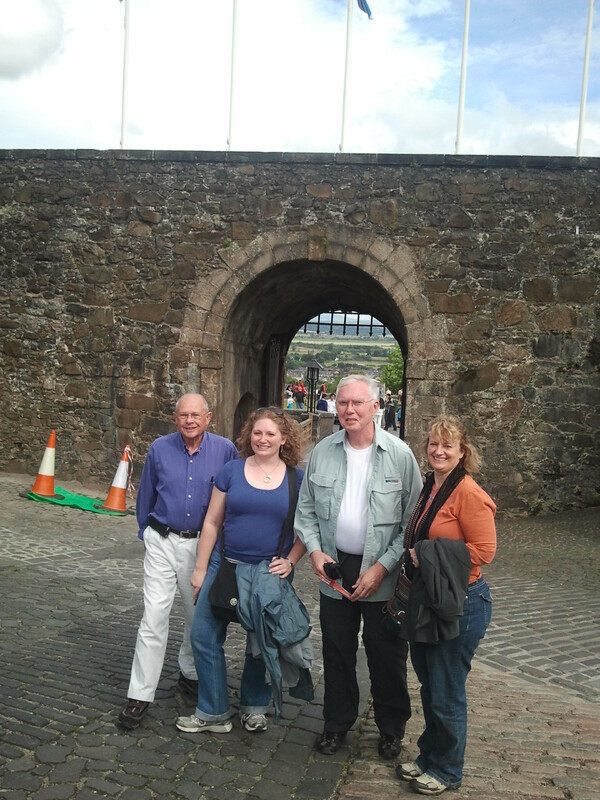 We’ll be here seeing the sights and learning more about Scotland…and then it’s off to Iona on Saturday! there are people here, not just cool old buildings! 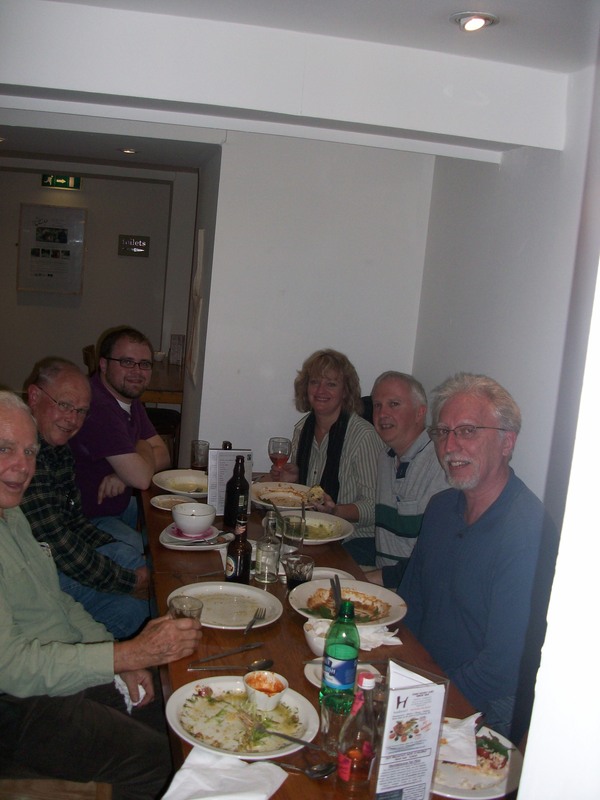 yay–we solved a technical challenge, and herewith bring you pictures with actual people in them! to say we do not understand this sculpture would be an understatement. “even more disturbia” was a phrase used…. 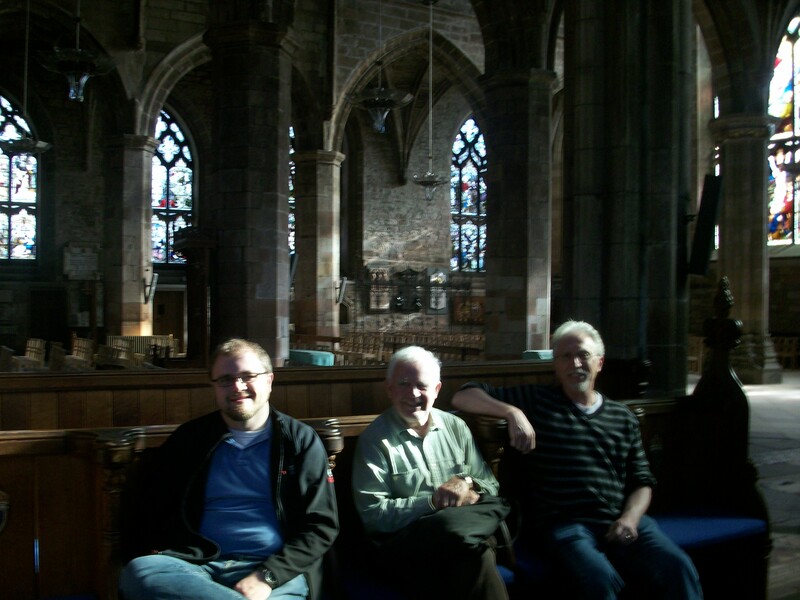 Today we went to worship at St. Giles, the High Kirk of Scotland. And believe us when we tell you, it was HIGH. Any Catholic or Episcopalian would have felt right at home. They read from the King James, sang extremely traditional music, and the organist and choir were both extremely excellent. There’s nothing quite like a pipe organ and a 30 voice choir in a 12th century stone cathedral. The acoustics are just delicious. After worship, several of our members had their first ever Indian food experience. Yum! We spent part of the afternoon at Mary King’s Close–a tour that lets you see a glimpse of what Edinburgh in the 1600s was like. Narrow streets crowded with people, animals, rubbish, and excrement….14-story buildings crowding these narrow lanes, which means very little natural light reached the lower levels…prone to plague…it was quite the place in those days. Our guides showed us both below-ground and above-ground sights and explained some of the history and social life of the period. Intriguing! 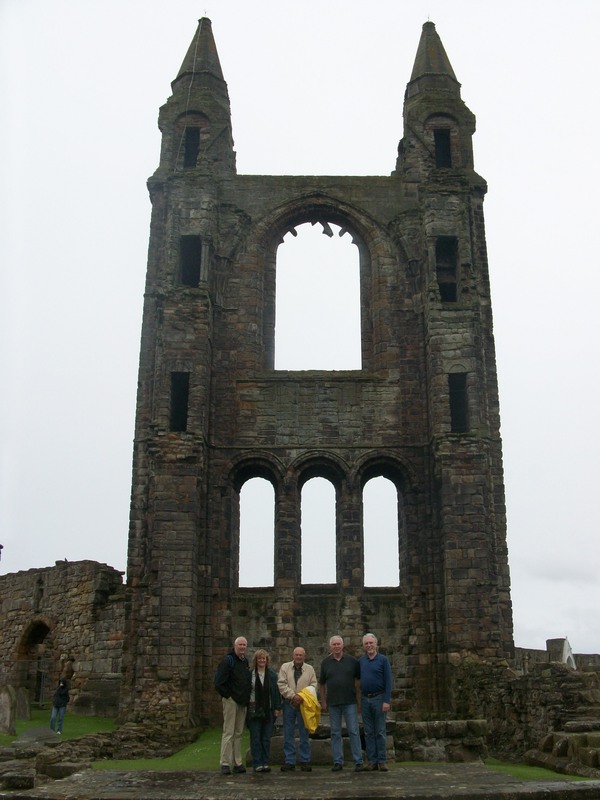 Tomorrow, we visit Saint Andrews–pray for the rain to hold off a bit! We’ve had three gorgeous days in a row now, and since the sights in Saint Andrews are all ruins, we could use another dry day tomorrow! Well, okay, in some technical sense this is day 2, because of how travel works, but we’ve now had just over 24 hours together as a group. It’s been pretty fantastic as we’ve explored, eaten good food, had some good laughs, and learned lots of new things. 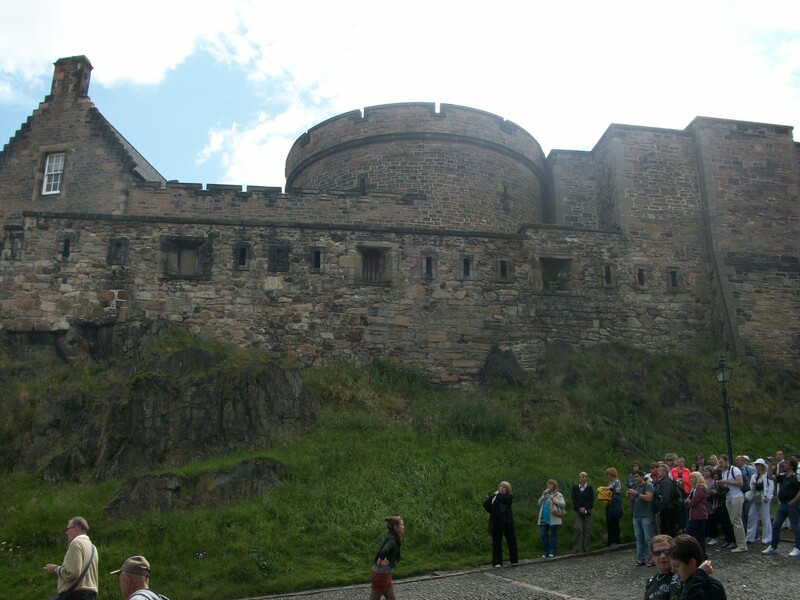 Today we traipsed around the castle, listened to bagpipes, learned a bit about the Jacobite rebellion of 1745-6, learned how to wear a tartan, seen the National Covenant (1638), visited John Knox’s house, checked out the cemetery at the Canongate Kirk, toured Holyrood Palace (including the rooms of Mary Queen of Scots, among many others! 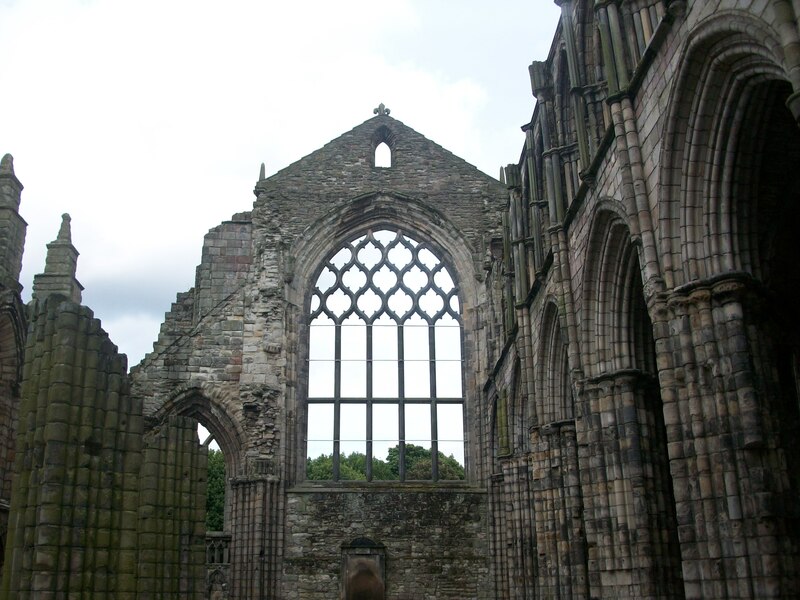 ), and learned about the Holyrood Abbey. In the midst of all that we’ve discussed religious and political history, sources of information, and economic philosophy. And, of course, the finer points of beer, whiskey, and dessert. 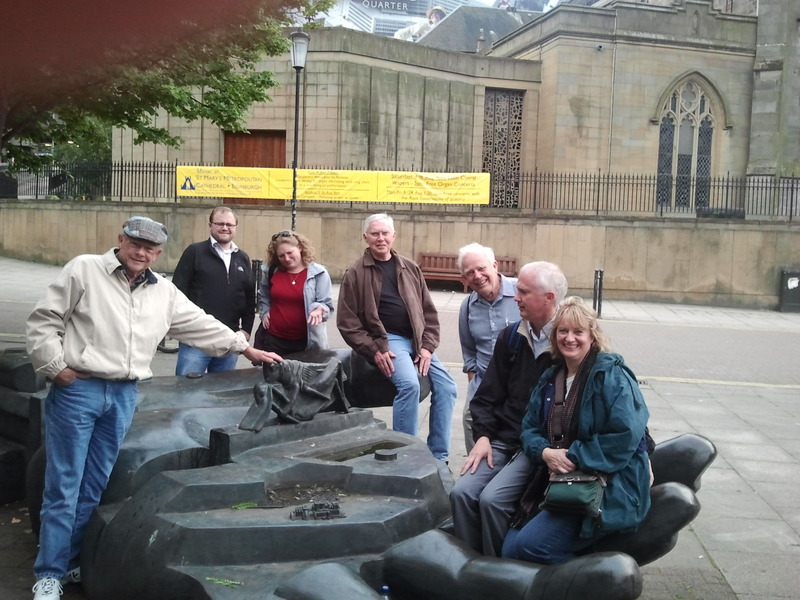 Tomorrow we’re headed to worship at St. Giles Cathedral, the High Kirk of the Church of Scotland. 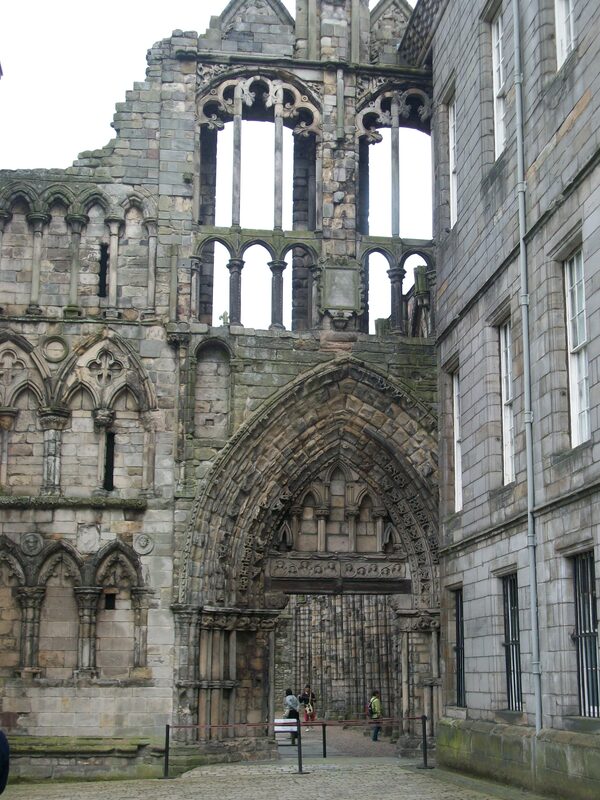 Then we’re exploring more of Edinburgh’s past via Mary King’s Close, Greyfriars Kirk, and the Grassmarket. 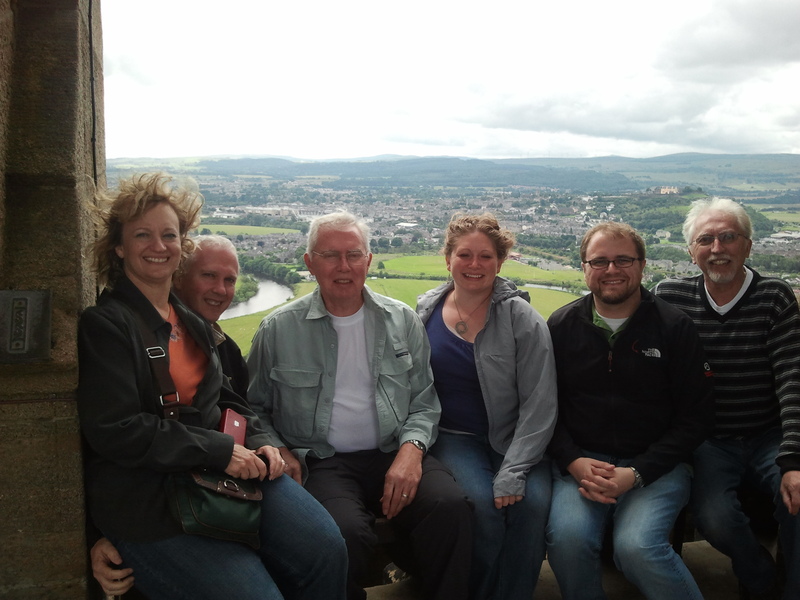 We may even have the opportunity to learn more about the Scottish Reformation from one of Teri’s friends who’s working on her PhD in the subject!